A community knitting group has been given a temporary new home at Middlesex University while their permanent home, Hendon library, is undergoing refurbishment. The group of ladies, who have been 'knitting and nattering' together for 10 years, were welcomed onto campus by fashion textile students who are keen to learn about traditional knitting and crocheting techniques from their new guests. 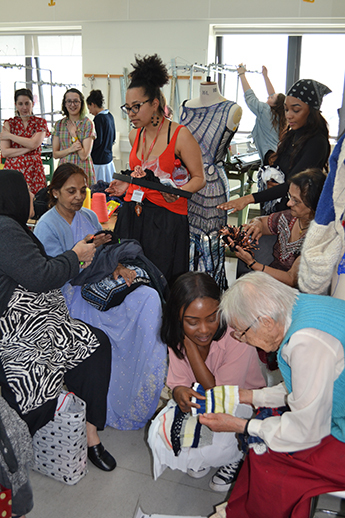 Fashion lecturer Anthony Campbell said: “At Middlesex we want to do all we can to be part of our local Hendon community, so we’re delighted to be able to offer the knitters a space. The group was originally set up by Age UK who approached Middlesex University to ask for a temporary home and it will now meet on campus every Thursday – treading the same corridors as Middlesex University fashion graduates Richard Gray, Mark Fast, Thom Murphy and Julian Seaman. Jackie Lai, a Mill Hill resident and Knit and Natter group leader, said it was "wonderful" to have found a temporary home at Middlesex. Jackie, who believes groups like Knit and Natter have a positive impact on people’s health and wellbeing, has founded a similar group at a local doctor’s surgery in Mill Hill.